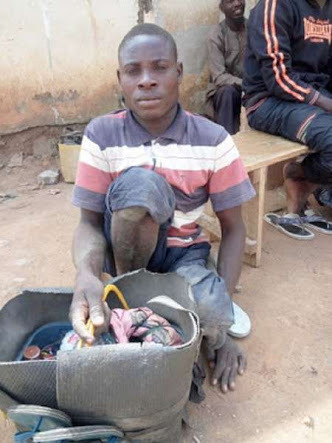 I stood and watched how the dexterous hands of the cobbler moved with expertise as he polished the dusty part of my shoes, bringing life to an otherwise dead shoe. He was tall, dark with white shiny teeth, I admired the zeal with which he worked with. And the smile he wore as he went about his business. All of a sudden, he reminded me of Ibrahim. In my primary school, there was a monopoly of the first and second positions by Esty and myself. She always came first, I came behind. It was like the modern day Messi and Ronaldo always at the helm while others come behind. The difference is while Messi and Ronaldo can kill themselves if football becomes war, ours was different, she was( still is) my friend. We sat together, did almost everything together and took the top two positions. This was the status quo except in Primary 4 first term, when Ibrahim broke it. It was the prize giving day, as usual the third to first in each class is called to the podium and given their report cards and gifts. The turn of my class reached. I was getting ready to come up next, I mean it was the norm, someone else picks third, I come second and Esty comes first. It was a change of the world order. For a brief moment, the briefest of moments, I thought this was it- the term I finally beat my Friend to the first position. So I was half- standing up to go take my cherished prize. I got the shocker of my life next.. What! !..this must be a mistake, I didn’t even make the podium. No, something went wrong. How can?… Ibrahim, since when..? A million thoughts ran through my little mind. In that moment, darkness covered the face of my world, it was without form and void and God didn’t Speak. Esther was crying, why.?. For losing the first position. I was crying, I didn’t even make the podium. A stranger was on our bed and has gate crashed our party. Our party of two- Ibrahim was that stranger. Ibrahim was never a threat until that moment, he was brillant and smart but he was always between the 5th and 7th position. So though brillant, we never thought him able to ursurp the monopoly Esther and I had created effortlessly. And he did that with a gap, he earned our respect and became our friend the next term. As kids, as a competitor, you were a friend, not an enemy. Subsequent terms, the world order was restored. We went back to our monopoly. Ibrahim left the next year,without completing with us due to financial issues. A waste of brillance, I thought. Here I was transfixed at this cobbler shinning my shoes, him reminding me of the witty and brillant Ibrahim who broke our well guarded monopoly. My mind running a 100metre through memory lane faster than Usain Bolt ever could. Oga I don finish… The cobbler said. He jolted me back to reality. I smiled, he really looked like Ibrahim. I wondered, if Ibrahim ever made it back to school. Or if he joined the almajiris and became something else. A cruel turn of fate, finance denying a brilliant kid of the chance to wow the world. When I go to the park, I see a lot of Ibrahims, a lot of people I realise, finance or a loss of parents have forced them to join the streets. To become a hustler and self-sufficient like the Ibrahim-lookalike I saw. So today, I thought about Ibrahim. The only Muslim in my class. And I wonder where he is now. P.S. If you are ever lucky to have people train you in school, the little you can do is to appreciate it by turning out well for yourself. Not everyone is that lucky, my friend Ibrahim wasn’t.